CENTCOM’s Coalition officers, Non-Commissioned officers and their families were invited to attend the Fort Foster Rendezvous on Saturday, 14 February at the Hillsborough River State Park. Hillsborough River State Park’s Fort Foster Rendezvous is a living history reenactment featuring military, Seminole, and civilian re-enactors, sutlers, traders, and craft demonstrations of the time during the Second Seminole War (1835-1842) in Florida. Last year, the CSO, the Park Rangers and Boy Scout Troop 111 were greatly honored to facilitate the memorable visit of Coalition Chairman Brigadier General (Sweden) Mats Fogelmark and a wonderful group of Coalition officers and their families. Tiffany Sotelo, current Constituency Chair for CARD-USF, recently presented a check to the Ybor City Museum for $1,000. She also announced that she has another check for the Hillsborough River State Park in the amount of $1,000. Here she is pictured with Park Services Specialist Patrick Potts and others. HRSP has partnered with CARD, which is the Center for Autism and Related Disabilities at USF. CARD advocates on behalf of people with autism and their families and is committed to increase local community awareness about autism spectrum disorders. HRSP appreciates CARD's generous support and hopes to work with them on future park endeavors. 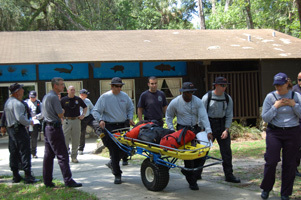 On Wednesday June 13,2012, Hillsborough River State Park and Hillsborough County Fire Search & Rescue completed a training exercise on the Florida Trail/Primitive Camping Area. This all day mock exercise offered a better understanding of the challenges that would take place for a possible snake bite victim within a remote area. A mannequin was used to simulate a search victim and placed at the primitive backpack camping area and a snake-bite 911 call was made. The SAR team was given limited information and had to problem solved finding the victim. Upon locating the snake bitten victim, the team needed to identify the type of snake, treat and stabilized the victim on site. Upon stabilization the victim was transported off a three mile trail-back to the main park. This pro-active training offered insight to strengths and weaknesses in dealing with wilderness issues at this state park. We hope to hold future trainings with the SAR Team and continue our working relationship. The weekend of March 17, 2012, the Hillsborough River State Park had a volunteer project at the primitive camping area on the 3.3 section of the Florida Trail. The volunteer group was a partnership with Brandon Chamber of Commerce and HRSP. The mission of this project was to improve the primitive camping area with assigned fire rings and targeted camping zones (low impact camping). This support would lessen the wider environmental impact of campers igniting multiple fires and camping in multiple locations within this remote location. The BCC cleared campsites, put up signs designating sites A, B, C, and D, put up a sign showing the rules for the primitive camping area, removed an outdated kiosk, and dug holes for fire rings. Phase 2 of the project will happen on Saturday March 31st with additional modification for the Florida Trail directional signs. This is a wonderful example of a positive community partnership; the BCC provided most of the materials for this necessary project. 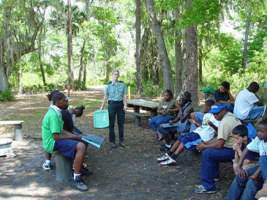 The Florida Department of Environmental Protection's (DEP) Florida Park Service was recently honored by ReserveAmerica in the 2010 Outdoor Awards: America's Top Campgrounds. ReserveAmerica, one of the largest providers of campground reservation services, honored Florida State Parks in 17 categories for outdoor recreation, including 15 parks named to the Top 100 Family Campgrounds. Florida's state parks were also honored in multiple other categories including canoeing, biking and hiking. "The Florida Park Service is honored to be recognized in a total of 17 categories on America's Top 100 Campgrounds list," said Florida Park Service Director Mike Bullock. "Providing clean, affordable and enjoyable places for Florida residents and visitors to recreate while continuing to restore our natural and cultural resources is our mission." The Hillsborough County Sheriff's Aviation Support Unit & Florida Park Police supported the park by identifying a new, primary landing zone for the state park. This new GPS landing zone will be utilized for future medical transport flights near our ½ acre pool area and will provide regular assistance to ground units for search & rescue operations on our trail systems. This three day program offered a variety of education activities to 26 youths that haven't had the exposure to an outdoor camping experience. 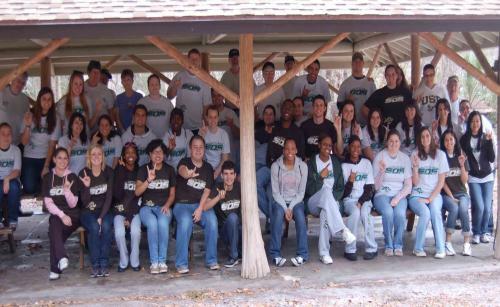 Hillsborough River State Park (HRSP) participated in the University of South Florida's (USF) Stampede of Service on Saturday, January 16, 2010 in-park area clean-up in preparation for our District IV Volunteer Appreciation in March 2010. Hillsborough River State Park will be the site location to host this important annual volunteer event. Stampede of Service was founded in 2006 by a student, Maxon Victor, who wanted to celebrate the Martin Luther King Jr. Holiday. It has now become one of the largest traditions that University of South Florida has to offer. This one day community service celebration is led by students to get the word out about volunteering. In 2009, 2600 students participated in the event. Students are assigned a social issue and sent throughout Hillsborough County learning and engaging in service for the day. HRSP hosted 75 student volunteers for this annual one-day 2010 event. HRSP gives on-going resources to various organizations to participate in community service on a constant basis. The purpose of partnering with community organizations is to get the younger generations involved in environmental issues! By: Elaine Lund, Hillsborough County Historic Preservation Program and TPI's Cornerstone newsletter. Hillsborough County's archaeological resources include prehistoric campsites, burial mounds, shell middens, quarries and manufacturing sites for tools, along with historic archaeological sites, such as Fort Foster. Scattered artifacts, usually tools or fragments of pottery, are the most common indicators of an archaeological site. Most of the identified archaeological resources in Hillsborough County date from the Archaic Period (7500-500 BC). The second most common type of identified archaeological resources in this County dates from the historic periods. Matthew Boggs was named Florida State’s Youth Volunteer of the year for his Eagle Scout project at Hillsborough River State Park. He designed and built trail kiosks and placed station trail markers along two of HRSP's trails. The station markers were GPS mapped so hikers along the trail can be easily located in an emergency. 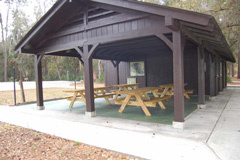 Hillsborough River State Park in the past years has received a new and improved park concession called the “Spirit of the Woods” Cafe’ and gift shop. With that being said the old park concession “Outpost” was standing vacant. The question was “What do we do with the old park concession?” Park Manager Kim Tennille and Volunteer Dave Moulton came up with a creative idea to breathe new life into this old structure. Hillsborough River State Park has taken advantage of the Federal Excess Personal Property Program to gain additional fire fighting equipment. This program was authorized under terms of the Federal Property and Administrative Services Act of 1949. 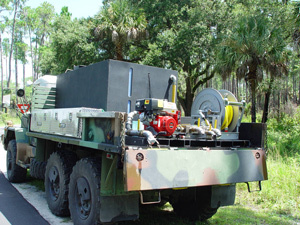 It is a low-cost approach to acquire additional fire protection equipment from the Division of Forestry and is on loan to support rural and wild land fire protection programs. Hillsborough River State Park/Fort Foster Historic Site has received collaborative agency assistance from local area Division of Forestry supervisor Patrick Keogh and FPS “finest” Rosi Mulholland our Division Fire Coordinator to build and create a Type 5 fire fighting unit. Having these additional resources within our park will aid in our on-going burn program and helpful in the event of a possible wildfire situation.